Every month, over on Twitter I help run and join in a monthly online book chat called @KidLitReaders We read a book, and then on a named Sunday get together at 8pm on #KidLitReaders and chat away about it. It’s great fun and a great way to explore the best of recent children’s lit. 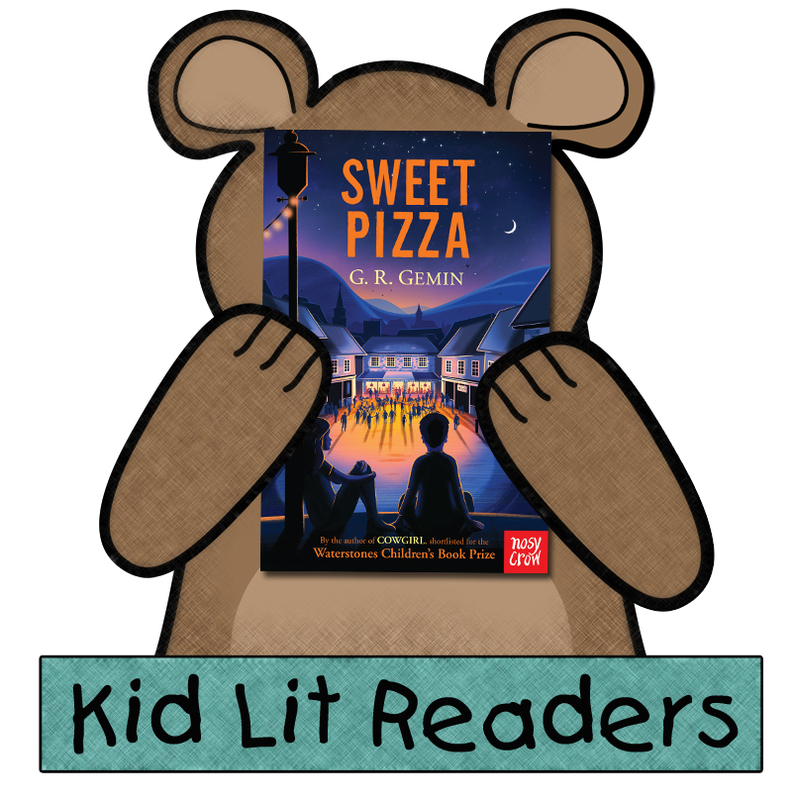 For June 2016 we chose the book Sweet Pizza, written by G. R. Gemin, published by Nosy Crow Books. Sweet Pizza focuses on an Italian cafe in a small village in South Wales. Young Joe, loves his Italian heritage the music, the language and most of all the food! Joe’s Mum is tired of running their failing cafe, but Joe is not prepared to let this family business close. So, inspired by the story of his family during the war, he works to save the cafe. Along the way Joe manages to inject a little Italian joy into the lives of all in the village. This book is, in one word, a joy. Packed full of wonderful and varied characters. One of the many things I absolutely loved about this book was the fact that every character had good in them. Yes there are bullies in the story, and people who maybe don’t make the best of choices, but each and every one is redeemed. We see that despite wrong decisions, or bad behaviour there can be good in everyone and the lovely young Joe is the boy to recognise this with the help of his Granddad, Nonno. It’s such a bright and uplifting message. Joe is not your ordinary hero. Last month I wrote on Twitter that I wanted to see more overweight children represented in a positive light in books. So many children’s books I have read recently have overweight children as either the “bad guys” or they are poked fun at. It’s rare they are the hero. Well, in response to my plea Mr Gemin replied and pointed me in the direction of Joe from Sweet Pizza. Although, coincidentally we had already selected Sweet Pizza as our book group read, I hadn’t yet started it. Well, I have to just applaud G. R. Gemin for his creation of Joe. He’s intelligent, lively, enthusiastic, kind and talented. All of the wonderful! He is also overweight. This isn’t a huge focus of the book, it is gently and sensitively referred to so that you are made aware of his size, but it in NO way defines Joe! It’s wonderfully done, and I thank the author for this. I love that Joe is not a typical young boy. He enjoys opera, cooking and his Italian heritage. He’s an absolute joy. Sweet Pizza is an incredibly quick read. Don’t think that it’s light and lacking depth though, it most certainly isn’t. The bulk of the text is dialogue which makes it fast to read through. I loved this. It made the story feel intimate. I felt like I was sat in the corner of the room watching this wonderful family live their life. I understood and grew to love every character in the story. This has been perfectly done. At the end of the book are a couple of little additions. Some information about the World War 2 references, explaining the true story behind the book, a wonderful section on appreciating opera, and finally a couple of recipes. Lovely stuff! This book could not have really come at a better time. As we break away from the EU and so many europeans are now feeling isolated and vulnerable, this book embraces immigration, embraces the mix of nationalities within the United Kingdom. Something which makes our continent such a diverse and wonderful place to live. Sweet Pizza is a glorious and heartfelt celebration of that. I honestly can’t find fault with this gorgeous book. It will make you smile, it will make you laugh, it will also make you cry. It’s an emotional roller coaster which has clearly been incredibly well researched and is full of all the joys of Wales and Italy, communities, family and friendship. Thanks very much, Ally. Glad you mentioned Joe’s weight “problem”. It would have been all too easy to have Joe go on a diet (apart from the imposed one) and attempt to change his appearance. It was never about that. Joe will always be tempted by a can of coke and chicken and chips – aren’t we all?